Twenty-five years had passed.The EDSA People Power Revolution of 1986 benchmarked the worldwide struggle for democracy and on its silver year, the silver legacy continues to support and fight for the existence of equal voice among the people of every country. In one way or another, the event brought back the majesty and dignity of our country. EDSA Uno—as what they call it—is impressive to Filipinos and foreigners alike who understand the real meaning of being deprived of basic social liberties. At the same time, this minute yet influential piece of history means a lot to us youth progressives who take pride on our militant roots. As an offshoot of EDSA, the Philippines moved to restore the democratic political structure yet still faithful to the elite’s entrenchment of their economic ascendancy over the social order. We acknowledge that the revolution ousted the elites Marcos put into place, and those who lost their power then restored their influence and placed themselves in the circulation. Nevertheless we cannot deny that EDSA Revolution put the despicable display of dictatorship to an end. EDSA Uno served as our grand means of regaining self-respect. In the February 25, 1986 peaceful protests around the country (particularly at the Epifanio de los Santos Avenue or EDSA) were done to counter the efforts by the Marcos administration to cheat on the results of the snap elections he called for with the intention of legitimizing his term of office as President. The people power denouement paved the way for the careful transition to democracy under Corazon C. Aquino—the widow of Marcos’ harshest critic, Benigno Aquino, Jr.—who assumed the presidency. The event inspired many uprisings in the post-Cold War era, such as the ones that took place in Germany, China, Czech Republic, and former Yugoslavia. The people power in Manila was even given its ample share of airtime on broadcast media and space in various international newsmagazines such as Time and Newsweek. The emblems of 1st EDSA People Power Revolution—yellow ribbons, the crucifix, roses, and the Laban sign—had their revival when adopted by successive popular revolts in the country such as the EDSA Dos, which ousted an equally corrupt president in 2001. People power, in its basic sense, has proven in many circumstances to be the most effective tool to chase off those who betray the trust of the electorate. The Movement for the Advancement of Student Power (MASP) had been an instrument of people power in the country. Our core values which upholds student militancy and student empowerment reflects the whole picture of democratic struggles in the country. 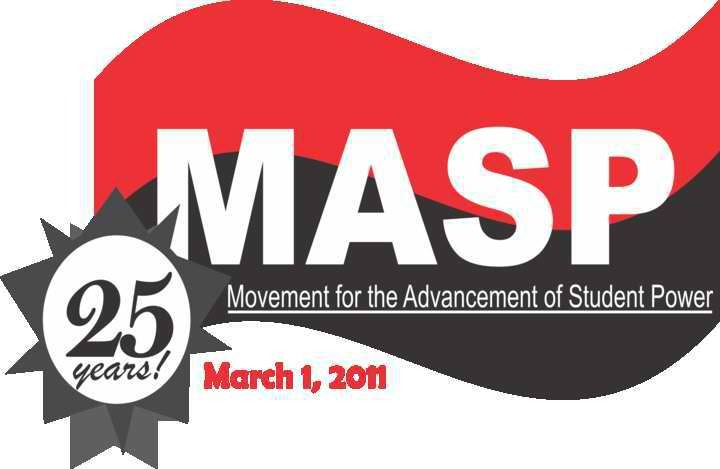 The student activism mobilized by MASP and other progressive student organizations during the time took direct actions in order to effectuate political goals in the national level. Twenty-five years have passed, MASP celebrates also its 25th year. MASP continues to consider its everyday militancy as an extension of EDSA Uno—of people power. Given the newer modes of acquiring information, MASP’s newer breed of student activists will mobilize the generation of technology-savvy, experimental, and abstractly idealistic Filipino youth in order to reclaim the spirit of the two EDSAs. The internet and mobile has become closely attached with the culture of the Y generation. In the Philippine experience, it has become an instrument of mobilizing the youth during major national uprisings. Youth activism is an important aspect of public life, basing on the premise that youth is a major part of civil society. The students of colleges and universities are potent partners in effective and conscientious governance, because of their capacity to imagine and to realize these imaginative ideas. Their idealism does is not boxed in their sector but also for the entire populace as well. Up to now, the spirit of EDSA People Power Revolution continues to haunt the tyrants of democracy everywhere in the world.And the spirit of youth activism embedded in EDSA continues to inspire the infant revolutionaries in dictatorship-laden areas such as Tunisia, Eritrea, Egypt, and Libya. The outbreak of civil accountability have trembled and torn down the outward and indestructible facets of despotism.